Members of Congress are alarmed over horror stories from Wells Fargo workers who say they were fired after blowing the whistle on illegal activity. 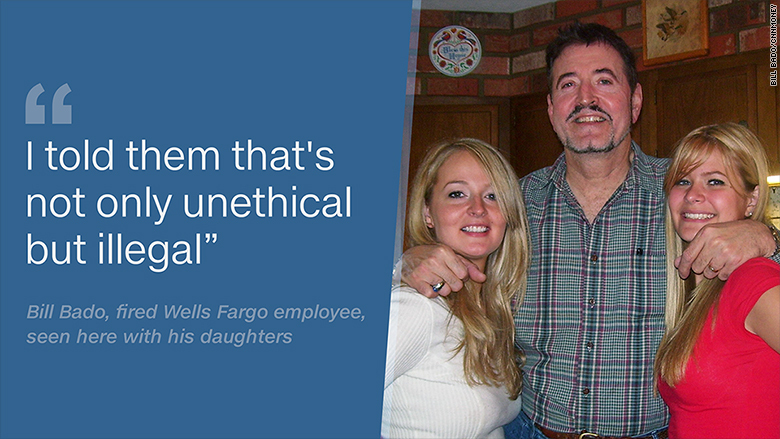 Nearly a half-dozen former Wells Fargo (WFC) workers told CNNMoney they were retaliated against for calling the bank's ethics line about the opening of fake accounts and similar issues. Now, lawmakers are grilling Wells Fargo CEO John Stumpf about the allegations. "Do you appreciate the kind of courage it takes to be a whistleblower?" Rep. Keith Rothfus asked Stumpf at Thursday's hearing before the House Financial Services Committee. Citing the CNNMoney report, Rothfus asked Stumpf if he knows how many "honest Wells Fargo employees may have lost out in a race with some of the fraudsters." Stumpf didn't have a number on how many Wells Fargo workers may have been fired or demoted after speaking up, but said the company is reviewing the matter. "Every one of them, we're going to work on," the CEO said. Rep. Gwen Moore told the story of a female Wells Fargo whistleblower from her district in Wisconsin who was pushed out after complaining about sales tactics. "Is there a fund for the good ones? What is the remedy for my constituents?" Moore asked Stumpf. Stumpf said he's aware of the retaliation allegations, calling them "very regrettable." "We're taking it very seriously," he said, adding that the company has a non-retaliation policy. It's the latest fallout since CNNMoney first reported stories from former Wells Fargo workers who tried to put a stop to the illegal sales tactics that lie at the heart of the fake account scandal that has rocked the nation. "They ruined my life," said Bill Bado, a former Wells Fargo banker in Pennsylvania who was fired eight days after sending an email in 2013 to HR about unauthorized accounts being opened. The Department of Labor has a Whistleblower protection program that protects employees who report violations. Harvey Pitt, former chairman of the Securities and Exchange Commission, told CNNMoney it's "clearly against the law" for a company or executive to "suppress whistleblowing." He cited Sarbanes-Oxley, Dodd-Frank and other statutes that make this "unambiguously clear." Lawmakers are beginning to pressure the SEC to probe the matter. 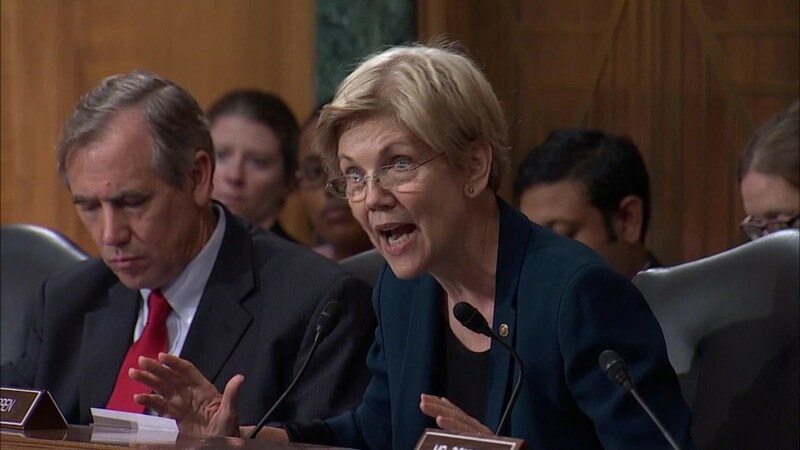 U.S. Sen. Elizabeth Warren and two of her colleagues asked the SEC in a letter this week to "investigate whether Wells Fargo violated whistleblower protection laws." The Senators cited CNNMoney's report and noted that workers who report misconduct are protected from retaliation under current law. Earlier this week, the U.S. Labor Department said it's reviewing both open and closed whistleblower complaints against Wells Fargo. It's part of a "top-to-bottom review" by the department of Wells Fargo cases, complaints and violations. At least one lawmaker believes the whistleblower problem could lead to even more serious legal problems for Wells Fargo. Rep. Stephen Lynch cited the allegations brought up by the Wells Fargo HR official who told CNNMoney of retaliation on whistleblowers at the bank. The official said Wells Fargo found ways to fire employees "in retaliation for shining light" on sales issues. Lynch said: "These whistleblowers were intimidated, or even fired." The lawmaker also suggested Wells Fargo could be prosecuted under the Racketeer Influenced and Corrupt Organizations Act, the statute known as RICO that has been applied against FIFA as well as members of the Mafia.